Swindon Proms are an evening of Glamour and arriving to your Prom venue in style is a must. At The Swindon Limo Company we know what a big event this is in your school calendar. This date is the end of an era for our pupils around Swindon and Wiltshire. Let us make your evening extra special by transporting you to and from your school prom with style and sophistication in one of our stretch Limousines or stretch Hummers. 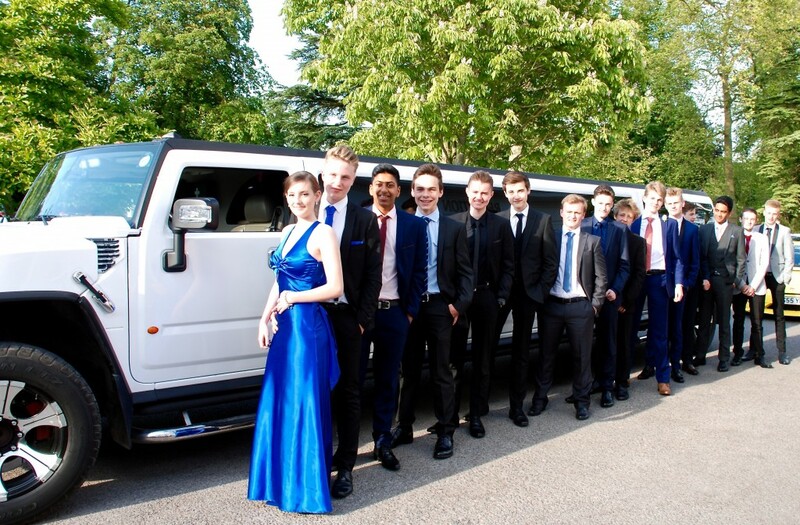 For the fun seekers of the school prom why not start the party from your doorstep with our 16 seat Party Limo Bus with karaoke, lighting displays and screens displaying music videos! We cover all venues across Swindon and Wiltshire, with popular venues being Cotswold Water Park Four Pillars Hotel in South Cerney were Limousine hire takes care of your transport needs. Wrag Barn Golf Club in Shrivernham, Blunsdon house hotel in Blunsdon and Alexandra house in Wroughton are prom venues that our prom queens and kings need Limousines from The Swindon Limo Company to arrive with a touch of class. Our stretch silver, pink or white Hummers can seat up to 16 prom attendees. The Marriott Swindon or The Hilton Swindon is always complimented by the arrival of our 8 seat silver Chrysler or the classic 8 seat white Lincoln. If its charm and sophistication you require from your transport to your school Prom then becoming very popular are our range of vintage cars. For Limousine hire in Swindon we can offer you our 7 seat Bramwith, 5 seat Regent both classically painted in black and ivory or our 3 seat Beauford in cream. Recently displayed in programmes such as Downton Abbey and Pride and Prejudice and films like Gatsby, what a great theme for your prom attire! At The Swindon Limo Company all cars are chauffeur driven by suited smart drivers, who are pleasant and courteous to the Prom party. Parents can be safe in the knowledge that all our cars are fully licensed by the appropriate authorities, fully insured and all our drivers are CRB checked. Take a look at our fleet page to decide which Limousine, Hummer, Party Limo Bus or Vintage Car suits your groups needs. Be aware that prom dates book very fast once released so don’t take too long deciding!